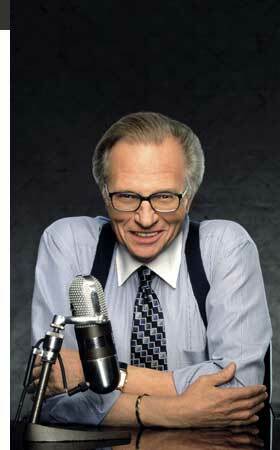 Larry King is finishing up his CNN run tonight at 9, after 25 years and some 7,000 programs. It is true that King was famous for asking easy questions and letting celebrities spin their own stories. And it is true that he was far too easy to tease for his suspenders and his many, many wives. But it is also true that King managed to get lots of famous people -- including politicians -- to talk relatively freely. Thatâ€™s an art, and an increasingly devalued art as bite-sized, prefabricated exchanges have taken over TV. He had a radio-era-styled approach to talk. King was also an expert when it came to creating episodes looking back over the lives of recently deceased celebrities. Early in his run, King helped usher in the cable news alternative. But his ratings -- and CNN's in general -- have dropped across this decade, as viewers have turned to more fiercely opinionated and partisan personalities. Once MSNBC and Fox News rose into prominence, King became increasingly less relevant. Piers Morgan, a perhaps more representative personality of brash cable TV news, begins his turn in Kingâ€™s timeslot next month. Are you going to miss Larry King? What we're watching on TV. Emily Wright is an Arts & Entertainment producer at Boston.com. Sarah Rodman is a TV and music critic for the Boston Globe. Meghan Colloton is a Things to Do and Arts & Entertainment producer at Boston.com. Michael Brodeur is the assistant arts editor for the Boston Globe, covering pop music, TV, and nightlife.